The universal UnityRemote from GEAR4 was designed to make controlling multi-media devices as simple as possible. Using UnityRemote, iPhone, iPod touch and iPad owners can control everything from TVs to Hi-Fis, Blu-Ray players to digital TV boxes — anything that has an infrared receiver — using one single device. UnityRemote consists of two parts. The first is an app, which is downloaded for free from the Apple App Store. The second part is a small and sleek device that receives Bluetooth and transmits and receives infrared signals. iPhones, iPod touches and iPads can not currently send infrared signals, so this clever device receives a Bluetooth signal from the Apple device and then sends an infrared command in 360 degrees via 5 infrared transmitters to the device to be controlled. UnityRemote is easy to set up. After launching the app, users simply select the device to be controlled from a long list of all the manufacturers you've ever heard of, and even those you haven't. If, for some reason, the device to control is not listed, UnityRemote can easily 'learn' how to control the device. Users can also set up 'actions' for UnityRemote to control multiple devices simultaneously. From one touch, users can turn on their TV, DVD player, digital TV box and their home cinema sound system. Users can adjust the remote layout so that one remote layout has the buttons for multiple devices on the same screen, like 'play' from the DVD player and volumes for the surround system. There's nothing to plug in to the iPhone and nothing to search for. 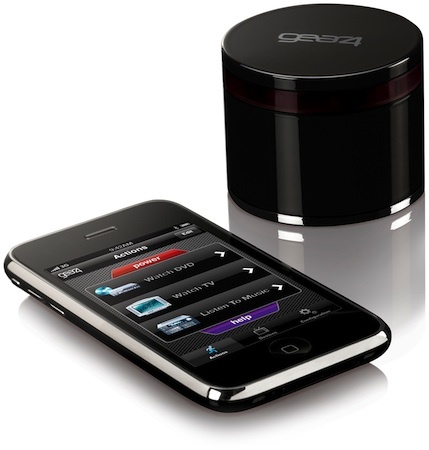 Simply enter the room and begin using your iPhone, iPod touch or iPad as a remote control. UnityRemote is compatible with iPhone 3G, 3GS, 4; iPod touch 2G, 3G and iPad. GEAR4 UnityRemote is available now in the US and UK for $99 or £99.